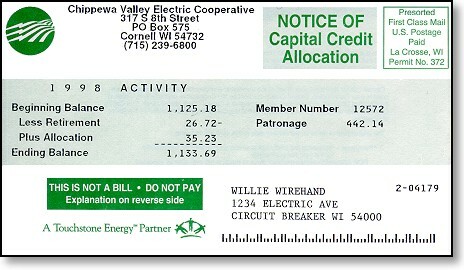 One of the things that makes Chippewa Valley Electric Cooperative different from an investor-owned utility is that Chippewa Valley Electric Cooperative is not in business to make a profit. We exist to serve our members. 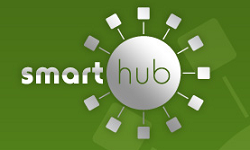 Capital credits are dividends that are paid to members from year-end margins. Margins are the earnings that exist when revenues exceed expenses. These are retained by the Cooperative for a period of time and used as capital for the continuing expansion of the Cooperative. Each member has a share of the margins allocated to them based on the amount of revenue contributed to the Cooperative. Each year the Board of Directors decides which years and percentage to pay back to the Co-op members. Allocation cards are mailed to inactive members, active members are notified of their allocation on thier bill, (usually the bill they receive in July). Each member's share is proportionate to the electricity used during the previous year. Beginning Balance: Total dividend earnings at the beginning of the previous year. Less Retirement: Dividend check issued the previous October. Plus Allocation: Amount of dividend added to account. Patronage: Represents the amount of business you did with the Cooperative for the year being allocated. The surviving spouse or heirs of an estate can request that the deceased member's Capital Credits be released from their account by notifying the Cooperative by phone or letter. The appropriate forms will then be sent to the requestor. Upon the return of the forms, the funds will be sent in the form of a check at the earliest possible time. Because the funds are being released prior to the normal 20-year retirement cycle, the estate will receive a discounted portion of the earned Capital Credits. The surviving spouse has the option of accepting the deceased's portion of the earned Capital Credits in its discounted amount or having the entire amount transferred to their name.